Minneapolis is seeking $7 million in federal funding to upgrade one of its busiest downtown streets for easier use by cars, buses, cyclists and pedestrians. The city will submit an application for the funding next month as it ramps up planning on the $16 million Hennepin Avenue reconstruction project, with work expected to begin in 2020. The goal: update a 10-block section of the busy thoroughfare that had its last major work in 1986. Plans that will be included with the funding proposal outline a revamped Hennepin Avenue that will have four lanes for vehicles plus a protected pathway for bikes on both sides of the street. In some areas, the bikeway would run on the sidewalk side of bus shelters to avoid congestion with bikes and bus passengers. In a City Council committee meeting Tuesday, officials stressed that the plan — developed after community meetings earlier this year — is still tentative. Additional public input sessions, which will be held over the next three years, will help refine the designs. Council members said they are excited about the potential for the city to try new design options on a street that gets heavy traffic from a variety of users headed to businesses, theaters, sporting events and other destinations. The street’s daily traffic mix includes 7,600 pedestrians, 1,500 bicyclists, 8,100 transit riders and 18,600 vehicles. At least one council member said she wants the city to approach the reconstruction with an eye toward non-vehicle traffic. Council Member Lisa Bender said the city should no longer always design its projects to ensure that vehicle traffic will flow at top speed at all times of the day. Bender pointed to a recent decision on the reconstruction of downtown’s Third Avenue, where she and others had advocated for a switch to three lanes plus a protected bike lane. Business leaders contended that reducing the four lanes of vehicle traffic would slow the flow, and the council voted to maintain four lanes. “As a matter of policy, we should start looking critically at how we are measuring success on projects like this one,” she said. 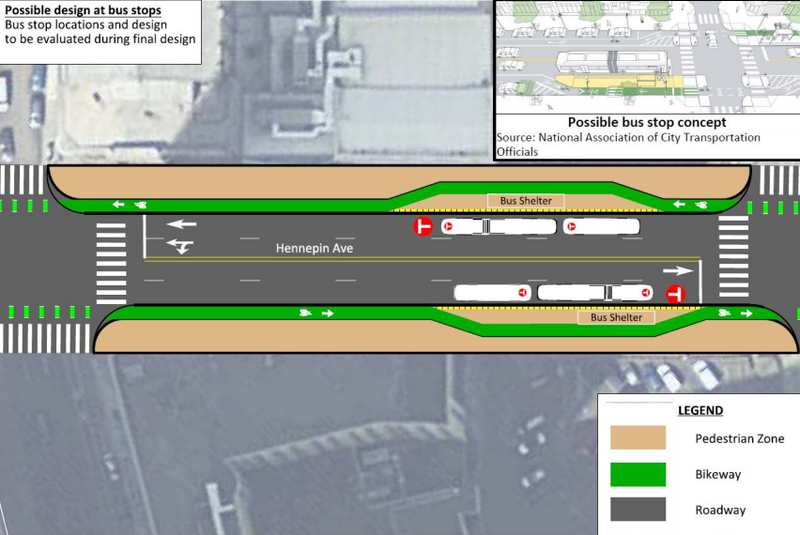 Above: Proposed concept for Hennepin Avenue from the City of Minneapolis.